Lauren + Mark had their first date at the Vancouver Aquarium, so for their wedding, they naturally wanted to hold both their ceremony and reception in one of the more unique locations for a wedding – at the Aquarium of course! We took this photo at one of Lauren’s favorite places in the whole Aquarium. 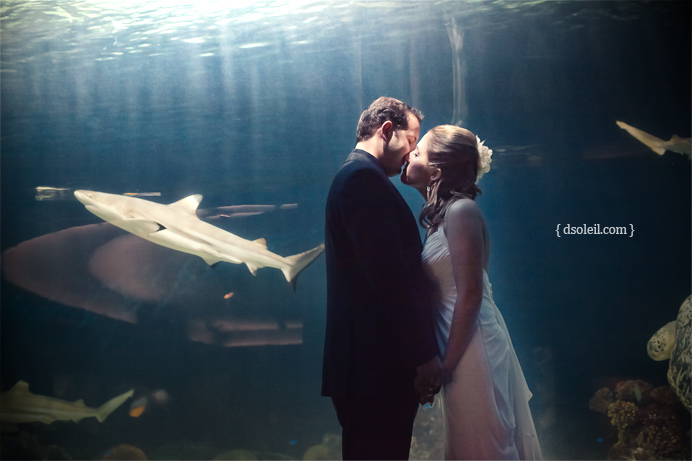 During his wedding reception speech, Mark noted that if you ever lost Lauren at the Aquarium, this is the exact spot where you’re most likely to find her – next the shark tank! Such a cool wedding indeed. Here’s just a little taste. I went to a wedding reception at the Vancouver Aqaurium in September 2009 and I must say that I was completely impressed. As a wedding planner myself, I would agree that the aquarium back-drop makes for such a unique event. This is a great image infront of the Shark Tank. Definitely a memory to share forever! Wow, beautiful We want more. Did you get any scuba diving photos? If I got married there or had a reception there I would have made sure that I could have been one of their divers to feed the fish.